In this series, we're asking celebrity chefs to tell us about their first kitchen jobs. 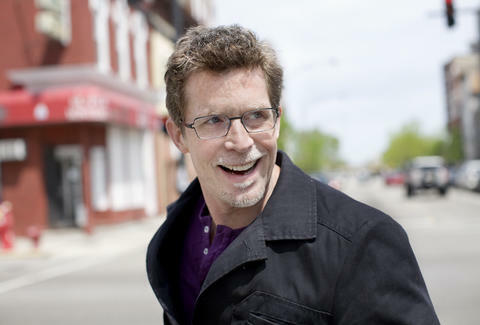 Our latest subject is Rick Bayless, the six-time James Beard Award winner who's responsible for some of Chicago's finest Mexican cuisine. He's also the host of Mexico–One Plate at a Time and the author of several cookbooks, the latest of which drops April 27th. We're going back before all that to Rick's formative years spent on the floors of The Hickory House, his parents' Oklahoma restaurant which sadly closed ages ago. After you're done reading about Rick, make sure to check out our first and second editions. I grew up in there, but started actually working when I was about 5 years old helping out with catering. It was carrying and schlepping things around. Setting up the buffets. Then at the end, we always passed out ice cream cups -- it was a BBQ place so we didn’t really do many desserts -- but we did that, and that was always one of my jobs. It was too far for me to walk right to the restaurant from school. And there was no real public transportation, so I was always looking for someone to take me. Sometimes my Father would come home, we would eat dinner, and he would take me back with him. We were in a working-class neighborhood so we had a ton of regulars. The restaurant was situated on a road between downtown Oklahoma City and the University of Oklahoma, so a lot of people stopped to pick up barbecue on their way to tailgate at a football game. It was more of a lunch place than a dinner place, especially during the week. My Mother could remember everyone’s name and was kind of the life of the party. The early achievement that sticks out in my mind the most was on Saturdays when I went in, I’d often make biscuits from scratch for everyone, the staff. We usually made a breakfast those weekends. I learned fairly early how to make really great biscuits and there was only one other person on staff who could really compete. So we’d have these sort of biscuit-offs. Sometimes I’d win, sometimes him. My Father always looked at his business from a customer’s perspective. Every day before we opened, he would walk in through the front door and enter the restaurant, looking at it like the rest of the world sees it. It’s something very few chefs learn how to do. And he would taste everything on the line every day before opening. I still do that in my restaurants. Kristin Hunt is a Food/Drink staff writer for Thrillist, and would gladly judge a Rick Bayless biscuit-off. Follow her to scoring sheets at @kristin_hunt.